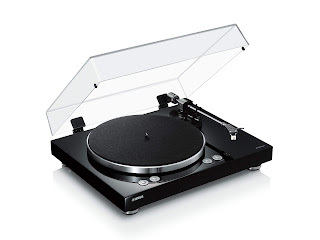 Yamaha has released a low-cost wireless turntable, the Yamaha TT-N503. 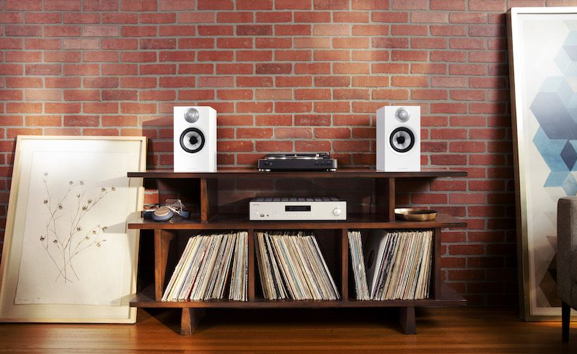 Stream your records and music services to MusicCast speakers with no wires attached and no receiver required. Wi-Fi connection ensures exceptional sound quality. With a MusicCast multi-room system, hear your records throughout your entire home. Hit the end of a record and don’t want the music to stop? With the VINYL 500 you can keep the music going by streaming from your music services via Wi-Fi, AirPlay or Spotify Connect. Take control of your music streaming and your wireless setups with the MusicCast app. 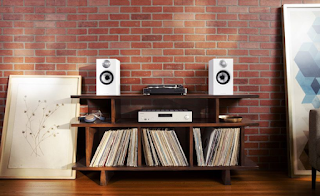 Create favourites, control your multi-room vinyl experience or MusicCast Stereo system. Geek out on all the options and settings to really make your music yours. Those who still consider turntables and vinyl the stuff of yesteryear need to think again! The vinyl revival is upon us and the TT-N503 fits the bill. If you are new to Vinyl then the new Yamaha TT-N503 is just for YOU! A belt-drive turntable that also includes network connectivity, music streaming and multiroom capability. What more do you need? The Denon CEOL N10 is the fourth generation entry in the company’s CEOL range. This latest addition to the line-up includes support for the HEOS multiroom system, and uses improved 5GHz Wi-Fi with MIMO (Multiple-Input, Multiple-Output) technology. This year Denon has also add Alexa Voice support and AirPlay 2. HEOS BUILT-IN - FOR THE FINEST MULTIROOM AUDIO. USB, TWIN OPTICAL AND RCA PHONO INPUTS - ALL INCLUDED. One of the most sophisticated mini-systems on the market, the CEOL-N10 packs massive sound into a compact and sleek design. It was built to fit comfortably anywhere in your home and fill it with beautiful sound. 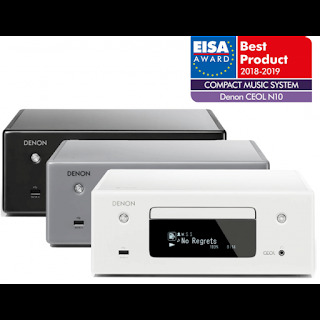 Streaming, CD, radio and more, hear it all from a compact and stylish system – the Denon CEOL RCD-N10. Sophisticated, sleek design and packed with features… available on-line and in-store this Christmas! 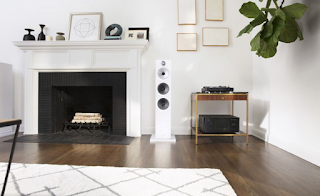 Give the gift of M U S I C.
Since 1966, Bowers & Wilkins have made continued technical advancements to design the perfect loudspeaker and in August they brought that heritage to vinyl enthusiasts and movie lovers alike with the new 600 Series. 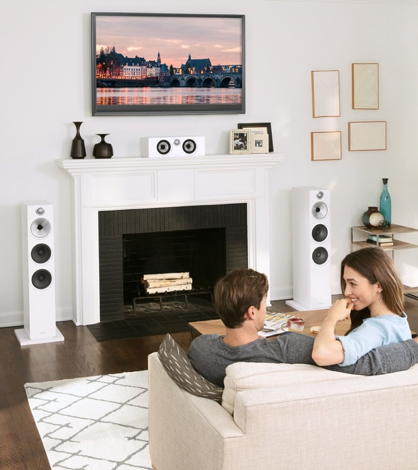 This range turns movie night into an immersive experience, and brings the music you love to life, as if the performer is standing in front of you. You can hear the engineering excellence and passion, and that is why their speakers are used in leading recording studios around the world, such as the legendary Abbey Road Studios, due to the accuracy they provide. Bowers & Wilkins is a global leader in bringing music and sound to your ears – and your experience – the way it was meant to be heard. The ground breaking feature of our latest 600 Series is the integration of their cutting-edge Continuum™ cone, which creates layered midrange sound with a pristine soundscape. The human ear is naturally tuned into sound in this frequency, and they’ve understood the power of the perfect midrange presentation for over a generation. Developed over an eight-year period, the Continuum cone was first featured on their flagship 800 Series Diamond models, including the 800 D3, now in use in Abbey Road Studios. It truly makes your music come alive, delivering the crucial sounds fundamental to any great music experience. The new 600 Series also features their patented and ultra-low-distortion Decoupled Double Dome tweeter to reveal astonishing levels of detail in your music. Whether you immerse yourself in stereo or surround sound, the 600 Series brings you closer to hearing Bowers & Wilkins True Sound. "The 600 Series is the perfect entry point into the Bowers & Wilkins high-fidelity audio experience," said Richard Campbell, Chief Revenue Officer at Bowers & Wilkins. "The new 600 Series embodies the original ethos of John Bowers' mission to deliver best sound quality and to set new standards for audio performance." Digital Trends - The performance was immediately impressive, with the new speakers sounding more organic, less coloured, and more accurate, to boot. 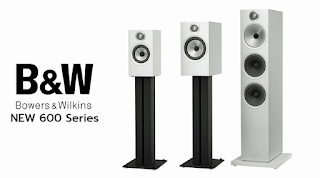 Home Theatre Review - The new 600 Series is the most affordable range to incorporate the remarkable Continuumä Cone midrange driver, developed and exclusively manufactured by Bowers & Wilkins to improve upon the transparency and accuracy of the iconic Kevlar cone. Techradar - It’s a great sounding line-up, and one that’s been long awaited, with Bowers and Wilkins perfecting the build over several years since the launch of the last series. Our Verdict - This range is aimed at home cinema enthusiasts as much as for those looking to upgrade stereo systems. The new Bowers & Wilkins 600 Series revealed a smoother, more detailed sound with a broader soundstage. The accuracy is also much better that than their predecessors. A definite MUST from our side! 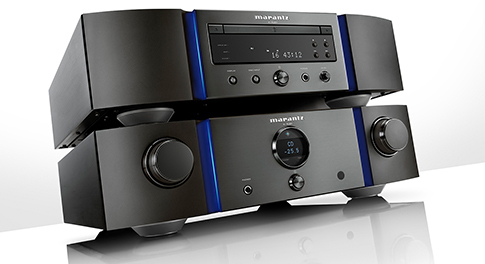 Marantz KI Ruby integrated amplifier and SACD player - 1 collectors set left! How to better celebrate your 40th anniversary than by developing a limited edition line! 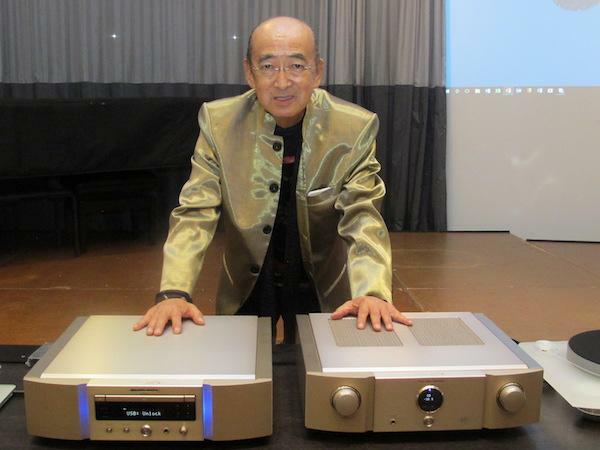 That’s what Ken Ischiwata must have thought while designing the new KI Ruby SACD CD-player and integrated amplifier. After forty years working for Marantz he well deserves his own premium line-up don’t you think? Off course these two hi-end devices are the renewing his last special edition that was released upon his previous anniversary with the company 10 years ago. Both the PM-KI RUBY Integrated Amplifier and the SA-KI RUBY Super Audio CD Player will only be in production for 1 years with only 500 units being produced of each model. That’ll be an extra motivation for the real collectors! Both models feature a ruby red colour finish along with Ken Ishiwata’s signature laser etched into the front panel. The PM-KI RUBY Integrated Amplifier features a fully discrete two-stage design with separate power supplies for the pre-amplifer and power amplifier. 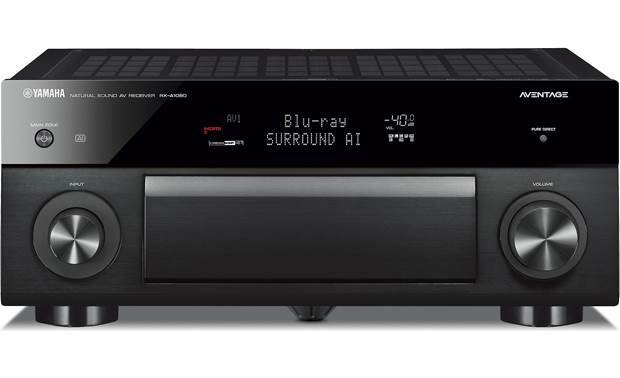 Also, the units features a moving coil and moving magnet phono stage complete with Marantz Musical Premium Phono EQ circuit and Marantz HDAM technology for signal purity and exceptional audio quality. Building on its analogue-only connectivity are six RCA inputs and two outputs, along with a 6.3mm front panel headphone output, while Marantz’s proprietary HDAM (Hyper Dynamic Amplifier Module) technology and copper-plated chassis are familiar inclusions on the spec sheet. aluminum top lid, solid aluminum front and copper-plated chassis • High-grade, carefully selected audio parts: ultra-low leak current Schottky diodes, low noise complementary transistors, high-grade resistors, newly developed custom electrolytic capacitors, audio grade film capacitors and mica capacitors. The SA-KI RUBY SACD Player is built with much of the same high quality components and design as the flagship SA-10 SACD Player. The new disc mechanism is digital and built from the ground up to satisfy even the most die hard audiophiles featuring SACDM-3’, for SACD, CD and CD-ROM playback. . The SA-KI Ruby includes an asynchronous USB input that handles formats up to PCM / DXD 384kHz/32bit and DSD11.2MHz. Optical and coaxial inputs and outputs, and a USB type-A input, are also included on the rear panel. 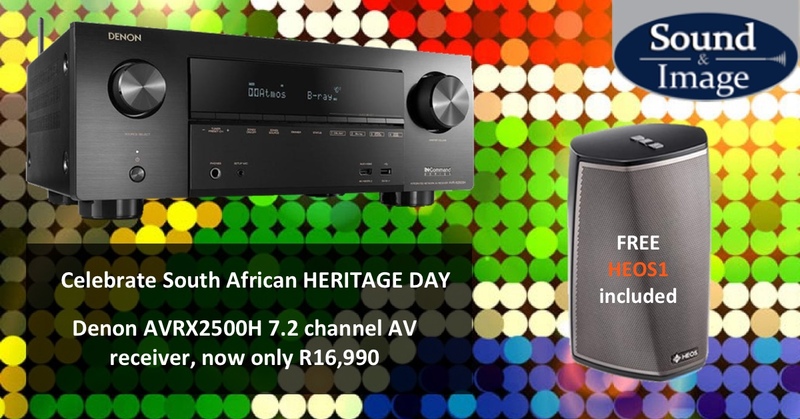 The PM-KI Ruby integrated amplifier and SA-KI Ruby SACD/CD are collectors’ items and we have only one of these special edition packages left in our Menlyn S&I store. This premium package sells at R154 000. Because Music Matters, the Pm-KI Ruby and the SA-KI Ruby carry the tradition of delivering a best-in-class listening experience for music and cinema. Denon AVRX2500H 7.2 Channel Home Theatre Receiver with HEOS 1 HS2 FREE !! 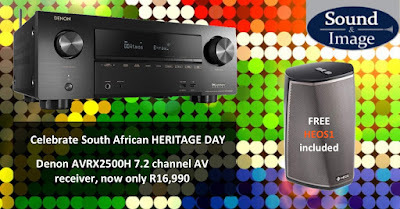 Sound & Image have launched a Heritage Day promotion – Buy a Denon AVRX2500H 7.2 Channel Home Theatre Receiver and receive a HEOS 1 HS2 FREE !! Denon's AVR-X2500H brings movie soundtracks to life with heart-pounding realism, thanks to decoding for Dolby Atmos and DTS:X. This 4K-compatible receiver upscales HDMI video sources so you can enjoy more of your video content in stunning Ultra High Definition. You can expand your system with two HDMI outputs for watching the same video source on two different screens, plus wired and wireless options for playing music in different rooms. 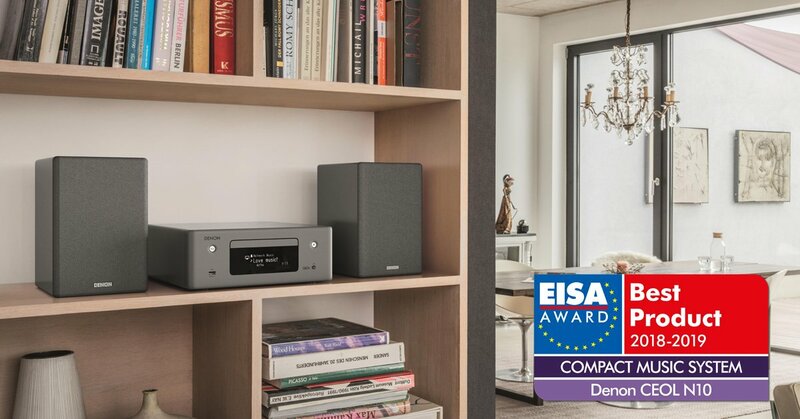 "Five-star products don’t take long to reveal themselves, and our decision on the Denon AVR-X2500H was straightforward in the end." What Hi-Fi? The Denon HEOS HS2 Wireless Speaker is designed to be as portable as possible without losing any of the sound quality. The HEOS 1 HS2 includes the much anticipated built-in Bluetooth connection as well as support for High Resolution Audio. It's small and humidity-resistant, so it goes pretty much anywhere in your house— including the bathroom. 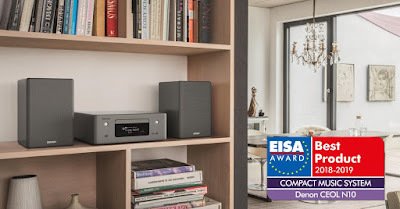 You can play music wirelessly through Bluetooth or connect to your Wi-Fi network for access to Denon's HEOS whole-home music system. You can stream music from a ton of different services. 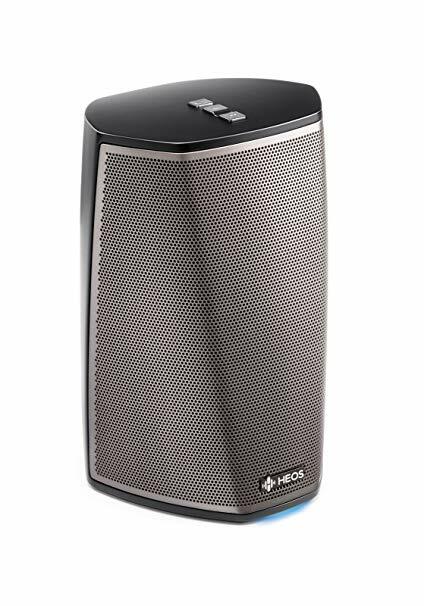 The HEOS HS2 Wireless Speaker is one of the most versatile wireless speakers we carry. There you have it audiophles- this combo is user friendly and delivers great music quality from literally unlimited music sources in any room, wirelessly. The award winning Silver 200 elevates performance to a new level delivering the best possible sound. The Silver 200’s sleek appearance makes it a truly compact and attractive floorstander, blending audiophile performance with lifestyle proportions. A pair of Monitor Audio’s unique 5¼-inch C-CAM bass drivers share the duties of delivering bass and mid/bass. 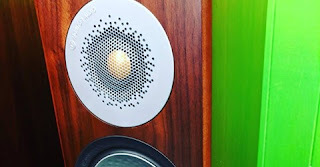 Configured as a two-and-a-half way system both electrically and acoustically, you will be amazed at the magical sound quality that this slimline can produce in your home. 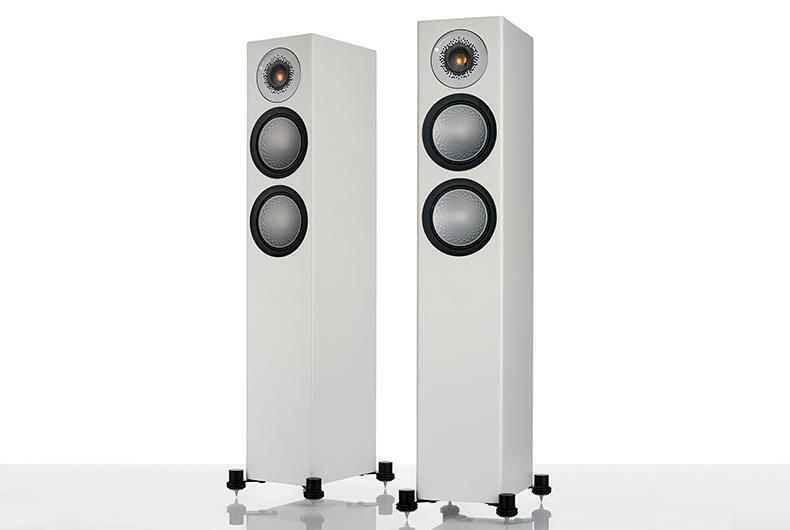 S&I Verdict - The Monitor Audio Silver 200 is a serious audiophile speaker with amazing drive and incredible musicality. 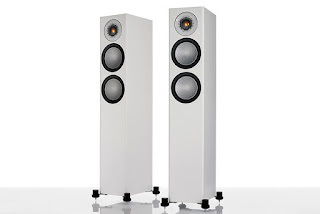 It is an elegant floorstanding loudspeaker that sounds as good as it looks. 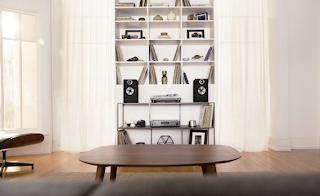 You will begin to rediscover your music and film collection as you’ve never heard it before.